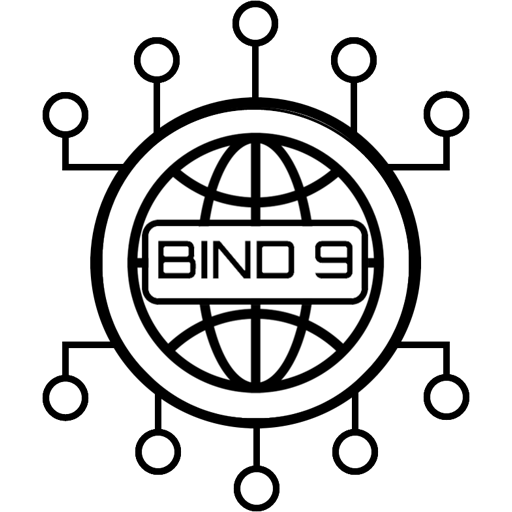 In this quick write up I am going to go over how to install Bind 9 on Ubuntu 16.04 and do a simple set up. 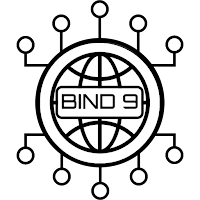 This bind9 server is going to act as an internal DNS server for me. It’s also going to forward queries that it is not authoritative for to Google’s DNS servers 8.8.8.8 and 8.8.4.4. First let me set up logging. Out of the box on Ubuntu bind9 logs, via the syslog tool, to /var/log/syslog. 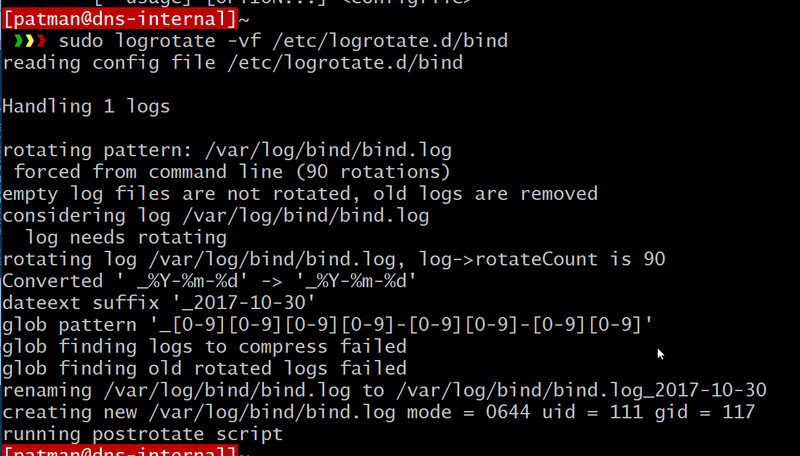 That’s fine and all, but I prefer to log to a standalone bind9 log file so I am going to set that up. Run the following commands to create folders and set ownership. Now tweak an apparmor setting. # syslog do the heavy lifting. 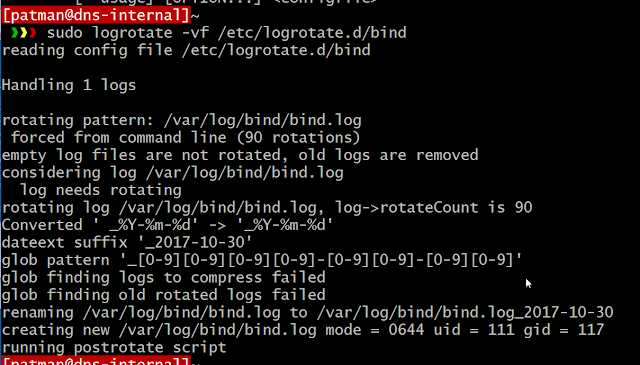 Next let me set up a logrotate for this log file. Now let’s edit the /etc/bind/named.conf.options file. Since I am only going to use this in my network I limited the clients to just my internal IP address range. I also added forwarders to use Googles DNS servers when not looking up local domains for which this DNS server will be authoritative it will use the Google ones. My dns server has ip address 192.168.0.153 so I am going to use that with the dig command to get some results. Nothing fancy yet I just wanted to make sure it was passing along its queries to the Google DNS servers. Edit /etc/bind/named.conf.local to set up zones for DNS this server will be serve. And place the following in it. This defines two zones 10x13.com and whiteboardcoder.com. The file for each zone will define what to return when there is a DNS lookup for its zone. Also this contains a reverse lookup 168.192.in-addr-arpa that will handle lookups of IP addresses and return hostnames. And in my case I will place the following in it. 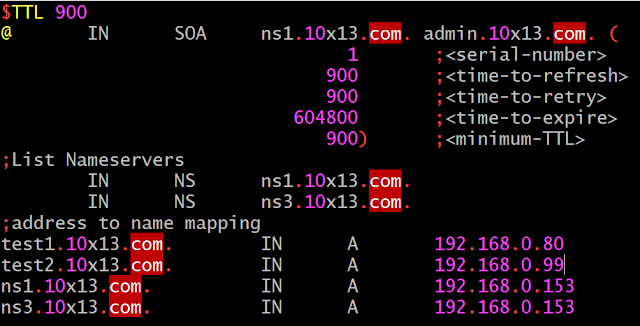 Time, in seconds, before a slave DNS must re-query this server for info on this domain. Time, in seconds, for a slave DNS server to wait before issuing a refresh request to the master DNS. If the master has not replied to a request to a slave DNS in the time to expire, in seconds, the slave DNS will no longer respond to request for this domain. 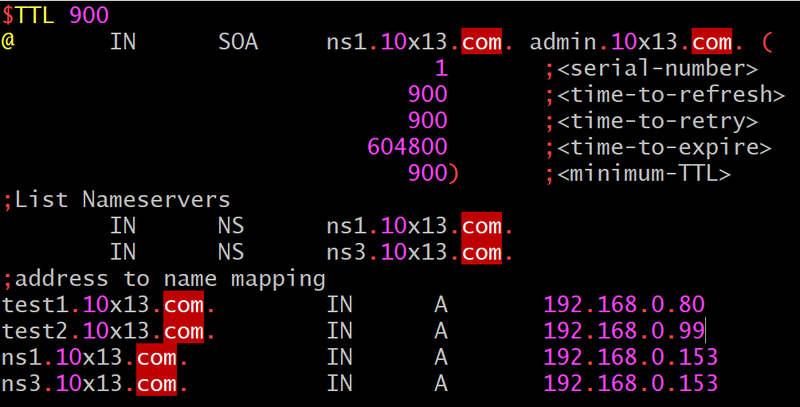 Time, in seconds, how long other nameservers cache the zone’s info. The actual domain name to IP address mapping. In this simple case I am just creating A records. The given subdomain results in the given IP address. Now to look up an IP address and get a domain name.